The themes this week were privacy and policy. With the US Independence Day holiday in the middle of the week, it’s not too surprising that there weren’t many updates from Google and other US companies. 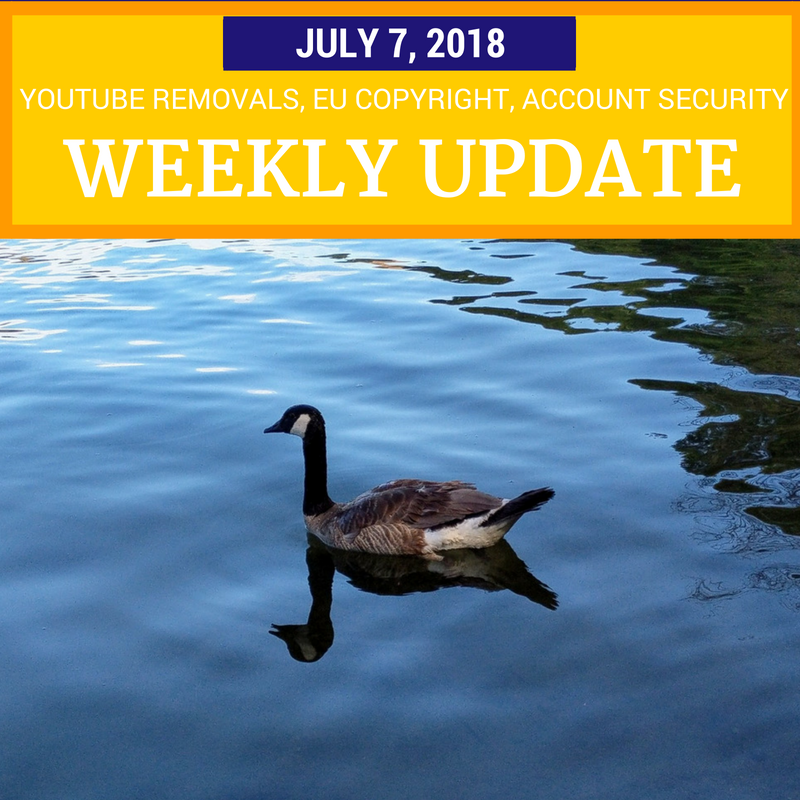 But what we do have are some news and discussions of content removal stats, potential privacy issues, and an update on the EU copyright policy reform proposal. Google’s Transparency Report for the first quarter of 2018, with stats for videos removed for violating YouTube’s Community Guidelines. Most videos were removed by automated systems. And it turns out the vast majority of human-flagged content was actually not removed, and individual Trusted Flaggers were responsible for most of the successful removals. YouTube also made it easier to moderate comments on your videos and channel. Instead of having to choose between holding all comments for review, or allowing all comments, you can now have YouTube hold potentially inappropriate comments for review. YouTube says that the system should improve over time, as channel owners choose to either report, hide or restore the held comments. What is “inappropriate” often depends on context. Facebook’s content review systems sometimes miss that, as one newspaper discovered when one of their posts sharing the text of the US Declaration of Independence was removed for “hate speech”. The post was restored, and Facebook apologized, but the sheer volume of content (and trickiness in determining context) means that we’ll likely be hearing about more cases like this one. Especially as Facebook and other big platforms like Google, YouTube, and Twitter are pressured to remove hateful content as rapidly as possible. The European Parliament voted to send a controversial copyright reform bill “back to the drawing board”. There will be a new vote in September. Of particular concern were the requirement for internet platforms to implement content filters (like YouTube’s Content ID, but for all kinds of content), and a so-called “link tax” targeting news aggregators like Google News. The Wall Street Journal reported that some companies that offer Gmail apps sometimes use humans to read email messages. This has only happened when users grant an app permission to view your mail, and it doesn’t appear to be a breach of Google’s terms. In response to user consternation, Google explained their developer review process, and reminded everyone to make sure that only desired apps have access to your account. AdSense turned 15 years old this month. In addition to adding animated balloons to every account (which hopefully will be removed at the end of the month), AdSense celebrated by adding Telugu as a supported language. Read on for links and more tips and updates for video creators, Plussers, business owners and more. And be sure to check out the “More around the web” section, which has some interesting non-tech articles this week. Image: I hope you stay as cool as this goose this weekend. Photo by me. Wikipedia goes dark in Spanish, Italian ahead of key EU vote on copyright (TechCrunch). Due to network security concerns, Youtube removed various links that does not meet it's security policy requirements. Thank you.